Splashdrone 3 comes in two versions like the Splashdrone version 2 - the Auto version and Fisherman (SAR) version. With added features and enhancements to technology used in its predecessor Splashdrone Auto version, the New Splashdrone 3 auto is an extremely modern Splash drone ever made. Its the most advanced waterproof drone available in Australia made by swell pro. There has been improvements to the Splashdrone fisherman version that is evident in the Splasdhrone 3 Fisherman version. It is the first fully integrated modular amphibious flying platform. Due to its latest flight control system, it's even more reliable than ever before. The newest propulsion technology along with the new custom 620kv motors provide the best possible balance between power and performance. The the newest quick release mechanism, you get even better experience with the Splashdrone 3. The Splashdrone3 auto version allows you to fly even in tough environment whether you are flying over land or the sea. Included 4K waterproof camera makes Splashdrone 3 Auto very attractive. This is an improved camera that provides great quality video and photo by improved sharpness and smoothness. You get high quality image and video without spending too much on expensive drone cameras out there. This 4K Camera works perfectly with the included 2 Axis Gimbal. So, the new splashdrone 3 is sure to impress many drone enthuiasts and fishermen. Comes in two versions - Splashdrone 3 Fisherman Version & Splahsdrone 3 Auto Version. Both the Splash drone 3 versions - Auto & Fisherman, now comes with greater ability to fly in challenging weather. Improvements have been made to this new splashdrone versions to withstand salt water, and is not prone to corrosion. Quick Release 1242 props & new 620 Kv motors enhance the splashdrone 3 power. Redesigned Carry Case, much better than those in previous versions. Bait Release mechanism is included. 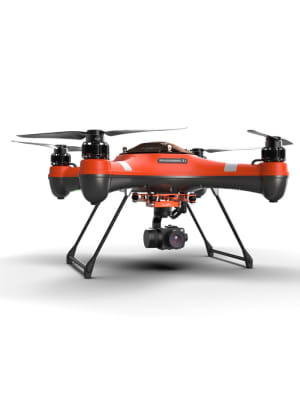 As with previous versions of splashdrone, the Splashdrone 3 fisherman or SAR version does not include camera, ground station, and gimbal. Therefore, there are some functions that will be not be available in the fisherman version including Autonomous functions such as Follow Me, Tap and Fly, WayPoint Mission. Difference between the Splashdrone Fisherman and Auto remains pretty much same as the last version. You can check our blog to find out how you can have both Fisherman plus Auto functionality by adding certain parts to each version, and key difference between splashdrone Auto and Fisherman (applies to both versions 2 and 3) - go to splashdrone blog.